Considering the extent of public speculations fearing for Fan Bingbing's personal welfare ever since she went missing, it seems the outcome is not nearly as bad now that the actress walks away from her tax evasion case with heavy fines. 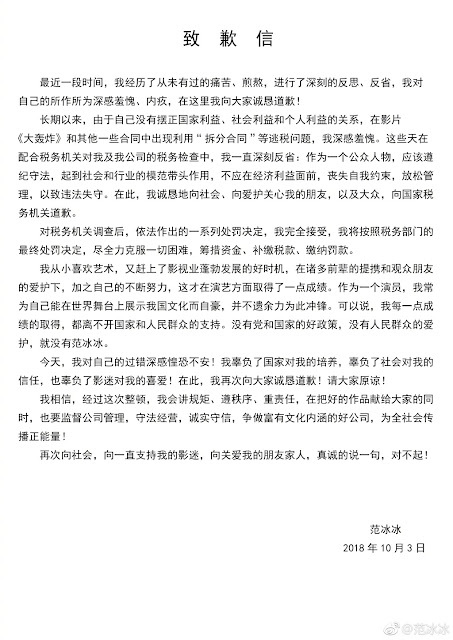 CCTV and various news outlets have just reported the conclusion to the government's investigations that began after Fan Bingbing was accused of tax evasion back in June 2018. According to the State Administration of Taxation and Jiangsu Local Taxation Bureau, Fan Bingbing made 30 million yuan filming the movie Unbreakable Spirit / Air Strike. She reported 10 million in income, but hid the remaining 20 million through separate contracts. Apart from that, Fan Bingbing and her companies were found to have paid 248 million less in taxes. For the offences committed by her and her companies, the government has slapped the actress with fines amounting to hundreds of millions to be paid in addition to the taxes that she owes within a stipulated timeline. Due to the offence being Fan Bingbing's first offence, she will not be pursued for criminal liability but instead will receive administrative penalties. If the payments are not made within the deadline, the case will be turned over to the police. Separately, Fan Bingbing's manager Mou Mouguang was found guilty of interfering with investigations after instructing staff to destroy important accounting documents. Mou Mouguang is under police investigation. 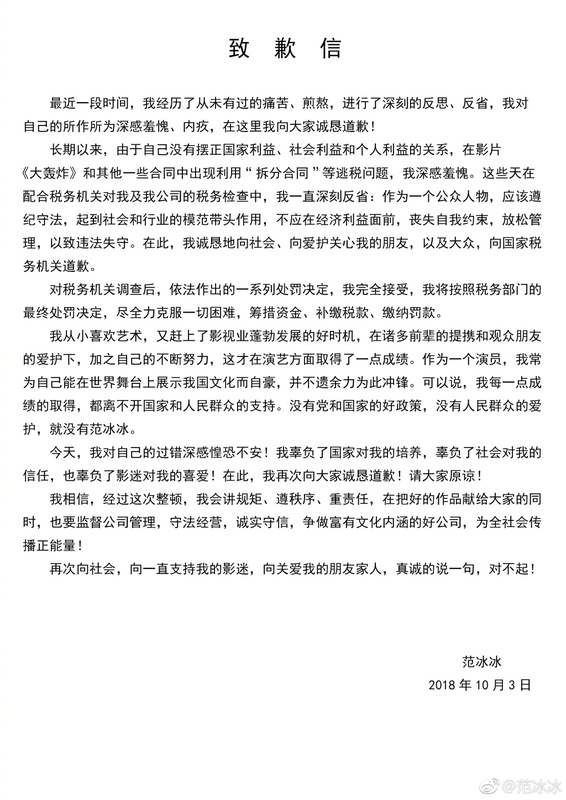 For the first time in months, Fan Bingbing finally logs on to weibo and takes the opportunity to issue an apology letter dated October 3, 2018. She expresses her shame, guilt and her deepest apologies for the mistakes that she made. Did she really write "mistake"? Wow! She didn't give Chinese people what was rightful theirs (taxes aren't paid for some corrupt upper ones, it is for financing schools, hospitals, infrastructure and more) and calls that a mistake. The high fine shows that is more than that. She is lucky to get away with a slap. In many Western countries she would have ended a few years in jail or at least with probation. doesn't seem like she's trying to make light of it though. It's just the way I paraphrased - the Chinese word she uses can translate to fault, offence, mistake. That said, i think she got lucky too. I'm actually surprised she's not getting jail time!! It's nice being FBB, i read in other blog the amount of tax she evaded are close to 1 billion n yet she didn't get any jail time, only need to pay the tax she owed + fines. I'm impressed by the government take on this, because china are known to be ruthless to tax evader, and now that they're commemorating their 40 years of economic reform, i'm quite shocked she's been getting off easily without being banned from the industry for some amount of time. Way to set an example to other celebrity. I thought financial crimes of 3 million renminbi or more can get the death penalty in china. Don't think the government still implementing death penalty for financial crimes. There's another case involving an actress in the early 2000, she evaded tax too, but her amount aren't even near 10% of the sum that FBB cheated. That actress got jail time + fined and her bank account seized. So, how the the hell did FBB just getting fined + paying back taxes is beyond me. That's why i said it's nice being FBB. The fines that FBB has to pay won't even make a dent on her net worth. I really think she got out of this tax evasion crime so easily considering how shady she is with her personal studio, investment and ying yang contract that she has been involved in. She should have at least gotten banned from ent-industry for years and that would also set an example for other top stars. So many actors are doing tax evasion crime as well, but they targeted FBB only so, people specualted she must have offended some high officials. Just another case of Government doing a deal with FBB. Use her as the main star of the scandal. Send clear message to industry to wise up. They agree to let her go with a fine as long as she pays her role well. Isnt FBB is most suitable actress to lead this saga? She will lay low for a while but she will climb again as this case clearly shows she is still very well connected and protected by the Higher guys in the Communist Party. Her position and standing in the industry is not shaken too much. I bet her new drama will be released in 2019. Well, I guess at least now we know she is alive. Considering the amounts seems like she got off pretty lightly. I wonder if her relatively high international profile helped her as I've seen foreign news outlets talking about this story and her appearance. I wonder how this will impact her career in C-Entertainment industry. If the government is fair like they say and will do what they said to dig into the other stars too...because It's too obvious that many high paid stars did the exact same crime (tax evasion). And like the saying goes you can break 1 stick but not when there are many together, so, if the government is fair and will go catch the others too, then I'm guessing the entertainment industry wouldn't want to let go 10-20 big stars at the same time or I could be wrong bc there can always be new stars that are way better. And of course if they get caught to be fair they won't go to jail like FBB as well. They're using FBB to set up an example to scare everyone, and she was the best choice bc of how famous and rich she is. Today is very different from a few years ago, so it's hard to say if these stars career will be over. For example years ago Raymond Lam and Edison Chen ran into scandals and their career is totally over. But today, people like Kris Wu got away with it although he ran into a scandal with Little Gina who greatly resembles Zhao Lying. And of course there are those people with tons of followers on Weibo and they can go around to mistreat or hit people all they want and still famous because of the followers they have. @ Anonymous: Thanks so much for your response. I think she certainly deserves to be punished because tax evasion is a crime and it was a huge amount of money...but she is certainly not the only one doing this. So like you said they are definitely making a very public example of her. I know men can sometimes come back from scandals but society tends to be a lot harsher on women so will be interesting to see what happens. Well I don't think she did all that alone and that's why her sentence wans't that heavy. Of course that she is the actress under the contracts name, but it's her company who get's them for her and get's a big part of the money too. I bet that there's a whole bunch of actors and actress doing that around the world. Of course I don't agree with what she did, but at least she was sentenced to pay what she evaded. She is a great actress and has a family to take care, so I hope she learned her lesson and can do better from now on.